Panasonic works on many markets and is almost everywhere famous for its original and innovational products. The notebook branch is not an exception – the company offers lots of "spirited" products. But the reverse side of such innovations and originality is a high price level, but it's up to you to decide what's more important. 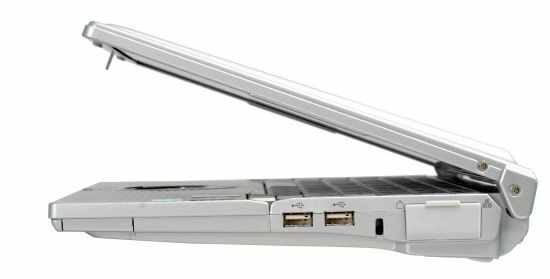 Two most famous lines from this company are rugged notebooks for hard environmental conditions and slim and light-weight models with rich functions. Today we are going to speak about one of such models. We should say a couple of words about the class of such devices on the whole. Notebooks with 11", 12" or sometimes 13" displays are intended for portability in the first place. So the main priorities for their design are compact dimensions and low weight. 12" panel is practically a minimum requirement for a notebook to fit a keyboard with standard-sized keys, suitable for touch method composition. So the main fight in this segment is to preserve small dimensions and low weight while providing acceptable functionality and usability. You should realize that such notebooks are always a compromise. Strict requirements to dimensions and weight force designers to pair down configurations, functionality is not always brilliant either. Such models are not equipped with powerful processors as a rule (it's more important for a processor to consume less power and dissipate less heat, to make the cooling system smaller and light-weight). They almost never have discrete video, using integrated solutions (the problem lies in space and heat dissipation again), they lack optical drives, have fewer expansion ports, etc. There have recently appeared models with an optical drive. But it usually results in a significant increase in thickness and weight. We'll show our cards right way: with its dimensions and weight of a usual 12" model, this Panasonic has a built-in optical drive. By the way, we reviewed Panasonic CF-Y2 last year, you can read the article here. Panasonic CF-W4 is a professional notebook designed for intensive usage even in complex conditions. The model successfully combines dimensions and weight of a usual ultra-slim notebook with very good ergonomics and functionality. Besides, it has a built-in optical drive and demonstrates excellent battery life. Moreover, this model has a high protection level against environmental conditions. Although W4 is not a rugged notebook, it's still much more reliable and can survive much rougher handling than most other models. In particular, the notebook can survive liquid in its keyboard and rather high falls. The metal body resists compressions and impacts, when the notebook travels as luggage. The sleek ultra-portable Toughbook W4 is designed for the high-output demands of today's mobile professionals. Full magnesium alloy case ensures maximum durability and industry-leading reliability. Intel® CentrinoTM Mobile technologies, used in the CF-W4, combine computational power and flexibility. They help easily execute applications, play multimedia presentations, or record CDs. Wireless access lets you keep tabs on current events, it gives access to your emails and Internet in your office or outdoors. We used the standard Windows profile for our tests - "Portable/Desktop". Display brightness was set to maximum. The results are more than impressive! Five hours and a half of battery life with the panel set to maximum brightness - a rare notebook can boast of such results. If we also take into account small dimensions and low weight of this notebook (there is no room even for a standard battery), the results become truly unique. Battery life of the Panasonic W4 significantly exceeds all competing models and even larger notebooks. The only models that can compete here are some notebooks from Sony, but they have some peculiarities. Considering that the device has just a 12" panel, it was impossible to do without narrowing the keyboard. 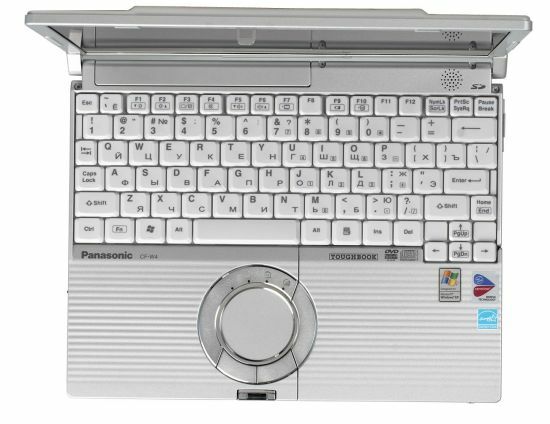 At the same time, Panasonic managed to create a miracle – the main buttons are not narrow (changing the size of keys and gaps between them has a fatal effect on typing by touch). However, the size of other buttons is not inconvenient either. They are smaller than on full-sized notebooks, of course. But you don't use them by touch, so it's not much of a problem. At least percentage of key misses was not much higher than with my own notebook. The keyboard is not inconvenient, though it's considered an unavoidable attribute of small notebooks with 12" displays. What concerns the keyboard layout, the main difference from the desktop layout is the ins/del keys near the cursor block. But that's an advantage rather than a drawback – when you get used to this layout, it becomes very convenient to locate a necessary position with a cursor and delete it – it requires minimal movements. Pgup/pgdn and end functions are assigned to Fn combinations. That's a drawback in the abstract sense (these buttons are frequently used for text editing, etc), but there is still no room for additional buttons. The top and bottom rows of keys are narrowed, so it's more difficult to press them. But you don't use them by touch, so there is no problem here either (the keys may be too small for some big people). The keyboard produces very nice tactile feedback – the keys are soft, good stroke. The notebook does well for typing long documents, your hands almost don't grow tired. Quite an unexpected (and pleasant) quality for a compact notebook. The touchpad is functional, but you cannot say that it's ultra convenient – the touchpad itself and the buttons are rather small. You can use them when you travel, but nothing more. It's much more convenient to work with a mouse, when at home. There are no additional keys in the W4, only the power and wireless sliders. Indicators are divided into two groups. The former is located in the fore part of the notebook, the second is over the touchpad in a silvery frame. The first group includes a power indicator (the power slider is backlit green, it's alight when the device is powered on and slowly blinks in idle mode), Eco indicator (we'll describe it below), battery indicator (yellow – charging, green – fully charged or working from a battery), and green backlight for the eject button on the optical drive. The indicators are bright and well readable. Even though the power indicator is blocked when you work with the notebook, it's not relevant - you know well if it works or not. There is no wireless indicator. The second group of indicators is also well readable, but the extreme left LED is covered by your left hand when you type. The case is made of excellent materials. The entire case is made of metal (but I have come across posts in Internet running that some side inserts are made of plastic and that they may crack, but it's hard to imagine how hard you should hit the notebook to crack it). It feels like an aluminum case. The body is solid, you just feel confident that nothing will happen to it, if you accidentally drop the notebook. I don't know about scratches. It wasn't scratched when I tested it, and I didn't want to scratch it intentionally. I guess it will do just like a usual case. The body design is also very interesting, you can see it on the photo. What I like most is the design of hinges, they seem reliable. The display lid does not sag. I think it will be very hard to bash in the panel in this model. The notebook design is thought-out well. First of all, the model produces a nice aesthetic impression. Secondly, it has very good ergonomics. I just don't like the round touchpad. In my opinion, its usability was sacrificed to design. And I don't like the display latch, implemented as a button, you cannot always open the lid with one hand. The case is "wedge-shaped", if you look at the side. So the keyboard is placed at an angle, which makes it even more convenient. The notebook looks very good – original and attractive. It concerns case materials as well as design (the sides are broken in two, to make the notebook visually thinner; the touchpad is round; wrist rests have bumped texture, the pressed display lid makes the impression of the notebook even better). I have very nice impressions of the case. Let's have a look at the layout of ports and controls. The front panel is rather crowded. The large power slider is on the left, followed by the wireless slider. 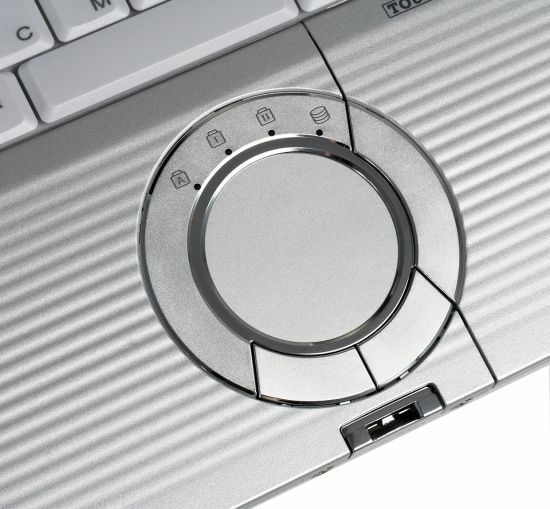 At the sides of the display lid latch (it should be pressed to open the lid, not always convenient to do with one hand) you can see headphone and mike ins. The right corner houses the eject slider of the optical drive. It's an electronic latch, as it does not open the drive directly. The left side houses a power connector, external video output, Mini Dock Box Replicator, 1 x PCMCIA, and a card reader under it. There are no connectors at the rear panel, half of the panel is taken by the battery, the other half – by the lid. The right flank contains: modem and LAN ports covered by a plastic lid (it's a good solution, these large connectors get dirty fast, especially if you work outdoors), Kensington lock, and two USB ports. In my opinion, all ports are too close to front. But it's not a drawback in case of this layout, just a peculiarity. The panel is suitable for text, but it fails to work even with photos, to say nothing of video. In addition to traditional low angles of vision and inversion of colors typical of TN-film, if the display moves from the 90 degrees, we noticed heavy non-uniformity of backlight (strong bleed at the bottom). Drawback? Certainly. I can only say in defence that we review a small thin notebook here, which is not designed for graphics. This peculiarity has little effect on usual office applications. There is just a single speaker over the keyboard. It's rather loud, but audio quality is certainly low. It just sounds system events, IP telephony, and the like. This model has no fan, so there is no noise from a cooling system. The left wrist rest gets rather hot. The entire left side of the notebook's bottom gets very hot, if you work from a power-line supply for a long time. So it's very unpleasant to keep it on your knees, sometimes even problematic. But that's the cost of quiet operation and long battery life. The optical drive is noisy, like all other notebook drives. It cannot be helped. You don't need it very often, so I don't see any problem here. Panasonic bundles this model with several utilities. First of all, we should dwell upon wireless utilities. These are a proprietary utility (it controls the 802.11a) and the standard Intel PROset that controls wireless communications. Intel's utility is rather convenient and configurable, so its usage is justified. There is also a standard touchpad utility, which offers much fewer settings than Synaptics, but all the basics are covered. And finally, a very interesting utility that enabled power saving mode (eco indicator works with this utility). It allows to maintain battery in optimal conditions – slightly discharged (down to 80%) and without constantly charging it to the brims. It helps prolong the life of Li-Ion batteries. Besides, the notebook comes shipped with a utility for burning B.H.A. 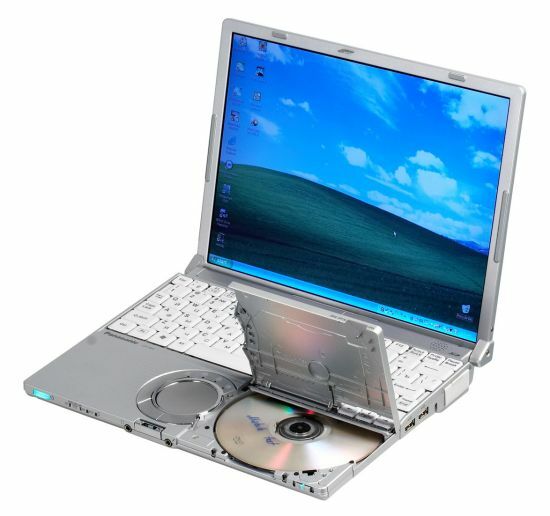 compact discs, as well as WinDVD player. 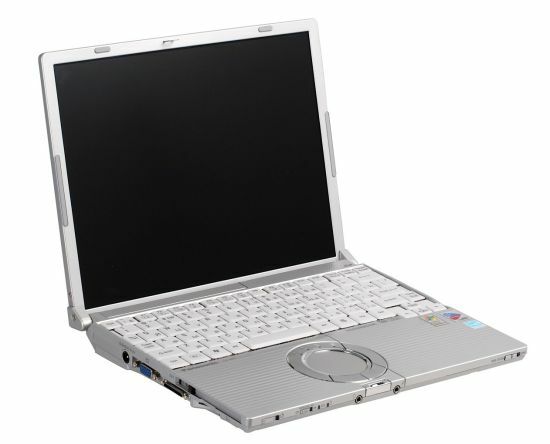 The notebook is also bundled with a battery recalibrating utility, a special power saving utility for the optical drive, and a number of other utilities. As you can see, the manufacturer paid serious attention to power saving. In my opinion, this model is a true companion for businessmen and managers, who travel a lot. They will like the convenient keyboard, tough metal case that can endure many accidents in their travels (remember the shock-mounted hard drive), and a very long battery life, so that they don't have to think about charging even in long trips. And don't forget about the built-in optical drive, which saves you the trouble of taking an external drive with you in a suitcase, wasting precious room and gaining weight, risking to lose it. You may leave an external drive at home, of course, and lose an opportunity to browse a CD from your partners or record your data on discs. The W4 is practically an optimal model for active travelers. But in my opinion, there is no point in using it "as a real notebook". The original silvery model with a nicely decorated touchpad, elegant, lightweight, and function-rich, will be a good present to a girlfriend. If you consider buying the W4, you should take into account that it's a specialized model, all its advantages will be revealed only in case of a certain usage model. This is not the model for offices, it cannot be used as a home entertainment center - its advantages will not be seen in these cases, but its drawbacks will stand out. It's a very good notebook, but it's designed for a special usage model. Its metal case, long battery life, built-in optical drive, convenient ergonomic keyboard, excellent protection – it's all implemented in such small dimensions and low weight! This notebook is practically ideal for active business travelers. Only the price is too high. But perfection is probably worth it.